Hey everyone! I always knew that at some point I was going to watch this movie. Prior to this past weekend, I’d never seen it. I figured that capping off #HogwartsOctober with it might be the way to go. If you’re unfamiliar with the plot, I’ll give you a quick run-down: Newt Scamander has arrived in America looking for fantastic creatures to write about for his upcoming book. Unfortunately, a few of his collection escape and start rampaging New York City. With the help of Jacob Kowalski (a No-Maj) and the reluctant help of Tina Goldstein and her sister Queenie, Newt hopes to put everything to rights while also solving the mystery of what is attacking the no-majs of NYC before it gets out of hand. The story of this started off a bit slow. I mean, there’s a lot that needs to be built: NYC’s wizarding community, America’s version of the Ministry of Magic, 1920s NYC, Newt’s backstory, the fantastic beasts, etc. There’s a lot that’s going into this. So it takes some time getting off the ground. I thought Eddie Redmayne did a good job as Newt. I can’t say I always understood the acting choices, but I came to like him. I also had to give Eddie kudos for his um…mating dance?…with the rhino-looking creature. Dear Lord, the utter ridiculousness of that scene would have had me in stitches if I’d have watched this in theatres. What’s probably more interesting is the character who actually stole my heart: Jacob Kowalski. The only no-maj in the story that we get to know, Jacob is pretty much us. He’s involuntarily sucked into this magical world and quickly finds out that magic is really freaking awesome–and scary. Definitely scary too. He quickly becomes the heart of this little group of misfits and I adored that about him. He’s just a happy-go-lucky kind of guy with big dreams and a thirst for adventure whose been locked in a life that bars him from all of that. What I thought was really funny about this was how much Newt reminded me of Hagrid. I mean, the love of weird and probably dangerous creatures? Check. Likes to call himself “mummy” when talking to said creatures? Check. Kind-hearted and gentle, even when the rest of the world doesn’t seem to understand them? Check. There are more similarities as well, but at risk of revealing actual spoilers, I can’t do that. Suffice it to say, Newt could easily be Hagrid just one generation prior. It was funny too watching this right after rereading the series because, based on the descriptions in the book alone, I was able to identify a couple characters. 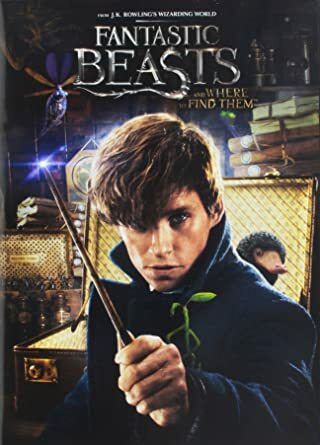 I was watching the beginning of the movie and when the first creature escaped, I was like, “Oh, that’s totally a niffler. Just look at it.” Then I immediately questioned how deep I’d gone into the wizarding world to be able to identify a niffler in .2 seconds flat. There was a minute or two there of legit soul-searching. Oh, and can I saw how truly American a few scenes were? Both good and bad. Jacob has a purely American dream he’s pursuing in owning his own bakery. He wants to create something himself because he knows he can do it better than the machines that are churning out hundreds more donuts than he can do by hand. And that was awesome. But the truly terrifying moment was this brief look at what the death penalty looks like for wizards in America. The way they tried to kill people but claimed it was completely pain-free…I got the heebie-jeebies watching that. Anyway, I thought it was an enjoyable movie. I’d accidentally spoiled the twist at the end for myself when I was reading something about the next Fantastic Beasts movie, but I still found it to be enjoyable.